Is your garden overflowing with zucchini? Do you think that you can’t possibly eat another zucchini? Well, do I have a recipe for you. Old Fashioned Chocolate Zucchini Cake is delicious. This old fashioned, made from scratch, chocolate cake is super moist with the addition of shredded zucchini. 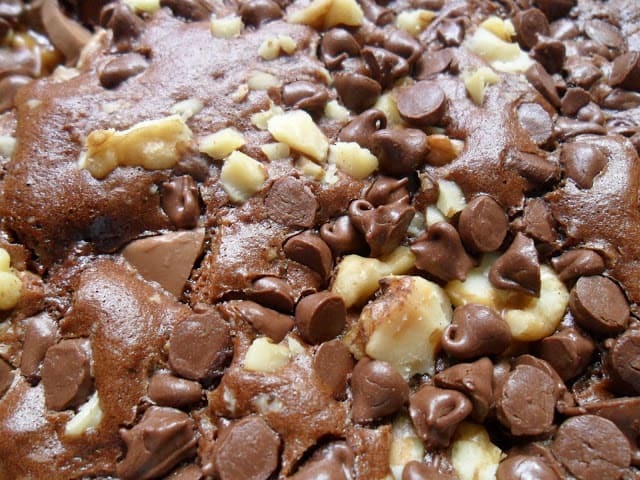 The top of the cake batter is sprinkled with mini chocolate chips and chopped walnuts before baking, adding an extra layer of yum. If you want to take this already delicious cake to new heights, serve old fashioned, chocolate zucchini cake with a big scoop of vanilla or chocolate ice cream. Talk about good! Some of my favorite desserts are the simplest. Warm chocolate cake with a big scoop of vanilla ice cream, warm chocolate pudding poured over a big scoop of vanilla ice cream, fresh mashed sweetened strawberries over vanilla ice cream and warmed Hershey’s chocolate syrup poured over, you guessed it, vanilla ice cream. A made from scratch chocolate cake topped with nuts and chocolate chips. In a mixing bowl, beat the butter, oil, and sugar. Add the eggs, buttermilk and vanilla; mix well. Combine the flour, cocoa, baking soda, baking powder, salt, cinnamon, cloves and allspice; gradually add to creamed mixture. Mix together well. Stir in zucchini. Spread batter into a greased 13 x 9 inch baking pan. 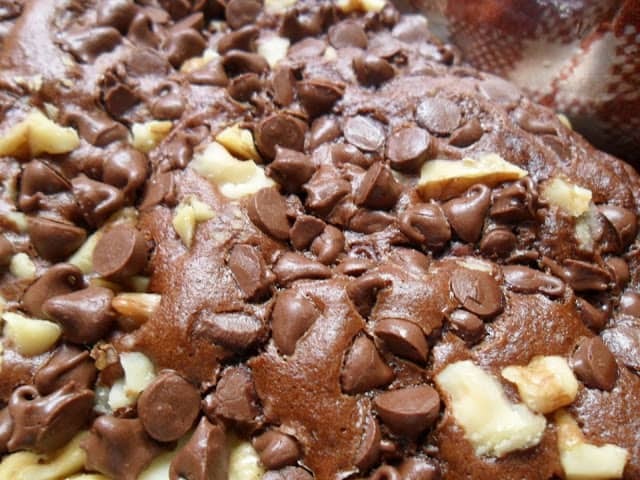 Sprinkle with nuts and mini chocolate chips. Bake at 350º for 35 to 40 minutes or until a toothpick inserted near the center comes out clean. Cool on wire rack. Products used in this recipe Nestle’s mini chocolate chips. For a change use cinnamon chips in place of the mini chocolate chips. Do you like Rhubarb? I surely do. Here are a few of my favorites: Country Rhubarb Cake and Rhubarb Upside Down Cake. 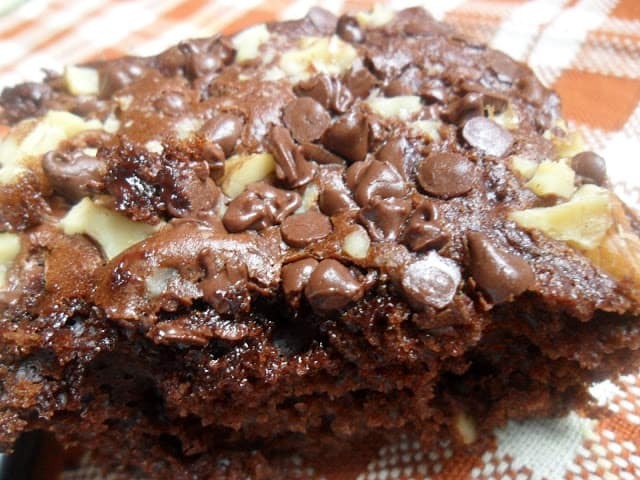 If your short on time, need to bring a dessert to a picnic and have zucchini coming out of your ears, make this quick version of Chocolate Rolo Zucchini Cake. Hi Lynn, your cake looks so scrumptious with all the add ins which I know the kids will love. Thanks for sharing this with Foodie Friends Friday this week. I've seen a lot of recipes for zucchini in cakes/brownies, but have never gotten around to trying it. I might have to give this one a try! 🙂 Thank you so much for linking up with me this week at Tasty Tuesdays! I’ve pinned this & shared it with my followers! This looks so delicious! Great way to use up my garden zucchini! Sandra from Scrumptilicious4you@blogspot.com Just stopping by from Anyonita Nibbles.